A map of Argo floats measuring ocean temperature, salinity and other factors. ERC researchers helped convert some of that data to sound – the better to understand it all. Erik van Sebille is an oceanographer and climate scientist whose research focuses on how ocean currents transport heat, nutrients, marine organisms and plastic litter between different regions of the ocean. He uses both data from ocean observations as well as from computer simulations of the ocean to understand how different regions of the ocean are connected. He is a strong science communicator who has been featured by the BBC, CNN, the New York Times and The Wall Street Journal, among others, and was a media fellow with the Australian Government Climate Commission. He initiated and developed the website Plastic Adrift where visitors can interact (via a rubber ducky icon) with how floating debris would spread through the ocean. The website has been used internationally in media outlets to illustrate the way plastics and other debris such as from the Fukushima tsunami and from flight MH370 moves through the ocean. In January 2017, Stef Veldhuis, a Dutch conceptual artist and composer, tweeted that he was searching for an oceanographer who could help him create a musical composition based on a romantic theme: a message in a bottle. So what does music based on the Argo ocean floats sound like? Here is a short piece, played by a string quartet, by van Sebille’s collaborator, Veldhuis. The tweet, floating on the choppy seas of cyberspace, eventually reached Erik van Sebille, an oceanographer and climate scientist at Utrecht University. Van Sebille runs a European Research Council-funded project called TOPIOS (Tracking Of Plastic In Our Seas). Its goal is to vastly improve our understanding of the way plastic litter moves through our oceans. Message in a bottle? Van Sebille suggested working with Argo floats, submersible robots that autonomously measure temperature and salinity of the world oceans, which van Sebille uses in his research. Argo is an international project with a global array of 3,800 free-drifting floats. Argo data, transmitted by satellite, are used by weather and climate centers to help understand the way the oceans affect climate. Thus, the project Music by Oceans was born. The trajectory of the floats, as well the temperature and salinity of the oceans that the floats measure, was the raw material. The data from the floats were then transformed into music (for string quartet). Some of the musical compostions were a direct translation of the data into sound, while others had a more creative input from Veldhuis. Van Sebille is an enthusiastic science communicator. He is also a natural-born comic actor who plays a geeky scientist in this short video, Ordinary Guy v. Climate Scientist, produced by the Australian Climate Council. With the help of van Sebille and Will de Ruijter, an oceanography professor at Utrecht, Veldhuis picked seven of the most interesting Argo floats on which to base his compositions. What makes one Argo float more appealing than another? Some have interesting trajectories; others have a personal connection for van Sebille. “My own favorite, #5902339, was one that I deployed myself in the Southern Ocean en route to Antarctica,” says van Sebille. Van Sebille, on the problem of plastic in the sea. There is a scientific point to all this. Van Sebille is used to looking at a lot of data, like graphs and maps. But since oceanography is now creating trillions and trillions of bits of data, it's almost impossible to visualise it all. 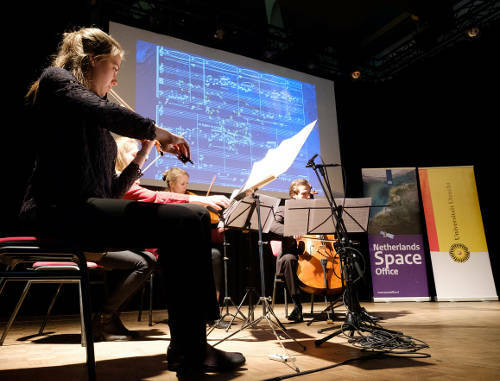 Hence, he and his colleagues on this extraordinary music project were keen to see how they could use the sense of hearing to explore the data they’re producing. The aim, he says: “Not to discover new science from that music, but to start a conversation within geophysics about how we are going to deal with the data we're facing. Because we'll need all our senses to cope with that deluge."